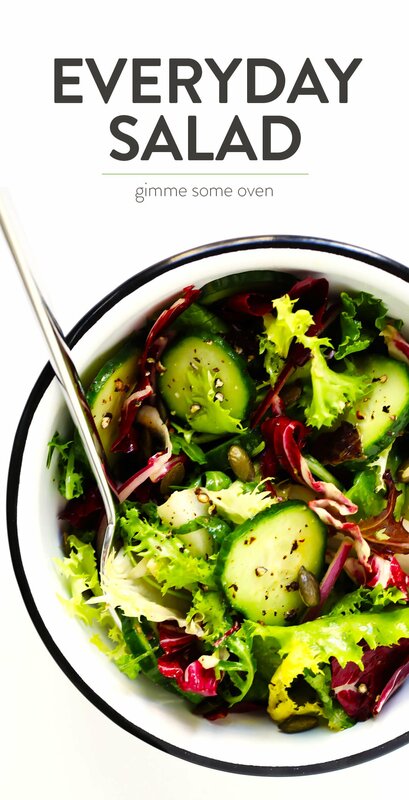 My everyday salad recipe — perfect for serving as a side salad or main dish. And since it also happens to be vegan and gluten-free, this simple salad is also perfect for serving to a crowd! Guys! 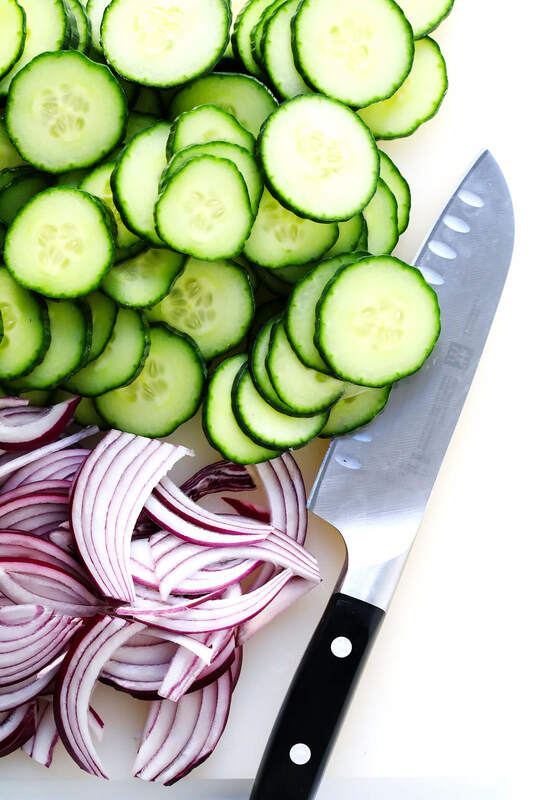 Do you have a favorite go-to everyday salad recipe that you love? It’s the real-life, no-frills, easy-breezy, nice-and-healthy, fresh-and-flavorful, always-a-winner green salad recipe that we make at home at least 2-3 times a week…and love. Truly. I think I’ve now made a version of this salad at least a hundred times, and we still somehow never grow tired of it. It’s one of those go-to standards we can always count on. It’s made with simple, healthy ingredients that are easy to always keep on hand. And it somehow magically goes with just about everything. 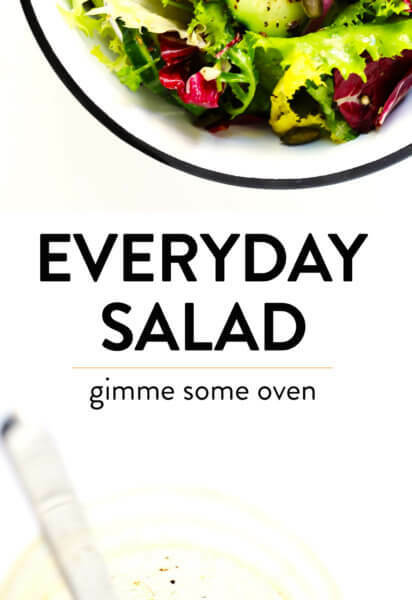 So if you’re looking for a quick and easy new salad recipe for your rotation, bookmark this puppy right now. I can vouch that it’s a keeper! 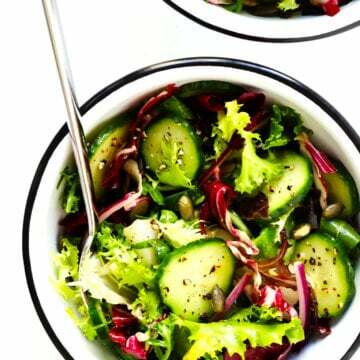 Fresh greens: I tend to usually go with a spring mix or bag of baby arugula for this salad, but any greens you have on hand will do. English cucumber: I prefer these because they are less bitter and have minimal seeds, but any kind of cucumber will do. Nuts: Pepitas (roasted and salted) are our go-to lately with this salad, which I love because they are perfectly crunchy, flavorful and inexpensive. But when we feel like a splurge, toasted pine nuts are always a fave too. 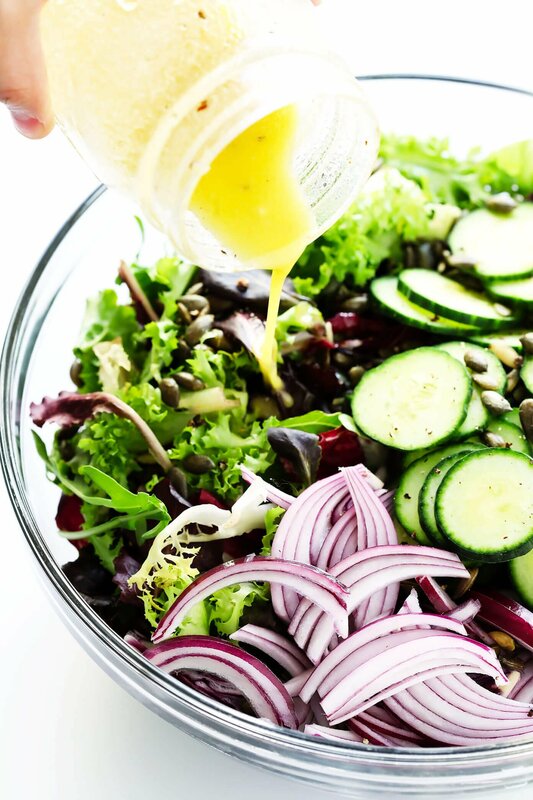 Lately, we’ve been on a lemon kick with this simple salad dressing. But if you don’t happen to have fresh lemon juice on hand, you can turn it into a vinaigrette by subbing in your favorite kind of vinegar. Also, you might note that this recipe yields a pretty small amount of dressing. I tend to prefer more lightly-dressed salads, both for the taste and for a healthier meal. But feel free to double the recipe if you would like the option of adding more dressing. Olive oil: Extra virgin for the win! Dijon mustard: Even if you’re iffy about mustard, trust me — it’s not overpowering here and instead really just rounds the flavors out. Garlic: I prefer to use fresh garlic, but you can also sub in garlic powder in a pinch. Sea salt: Definitely give the dressing a taste and add more if you’d like. Prepare the salad dressing: To make the salad dressing recipe, just whisk all of the ingredients together in a bowl (or shake them up in a mason jar) until combined. 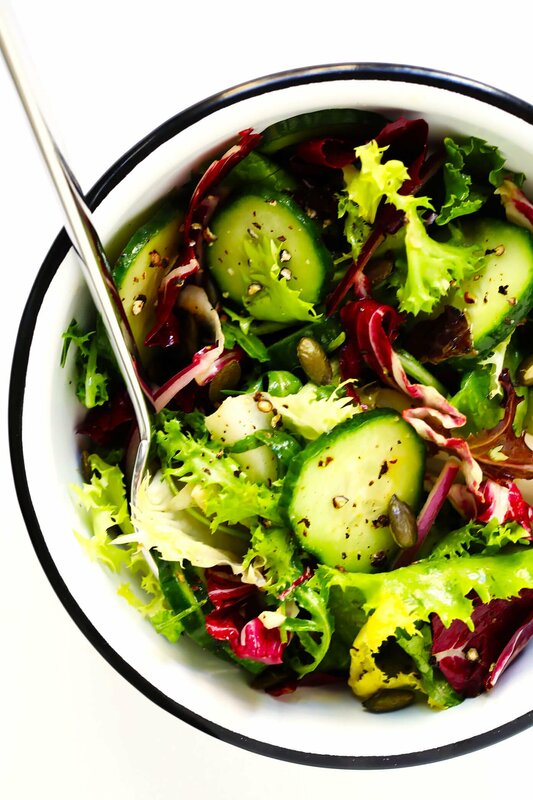 Toss all of your salad ingredients together: Combine them in a large bowl, drizzle evenly with the dressing, then toss lightly until combined. Jarred veggies or olives: roasted red peppers, marinated artichokes and/or olives are also delicious, and perfect for grabbing from the pantry. Proteins: cooked chicken, steak, pork, shrimp, salmon, or tofu would all be great added to this salad. Hope that you all enjoy this one as much as we have! Cheers! 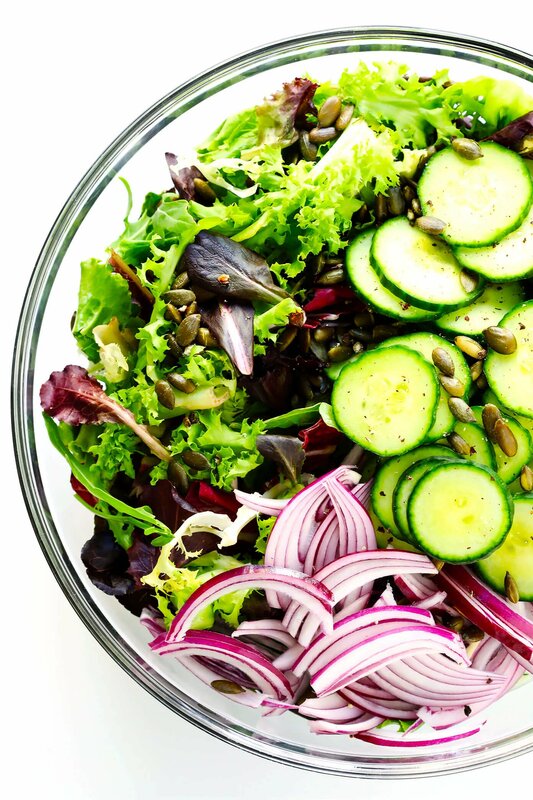 Our real-life, no-frills, easy-breezy, nice-and-healthy, fresh-and-flavorful, always-a-winner everyday green salad recipe. 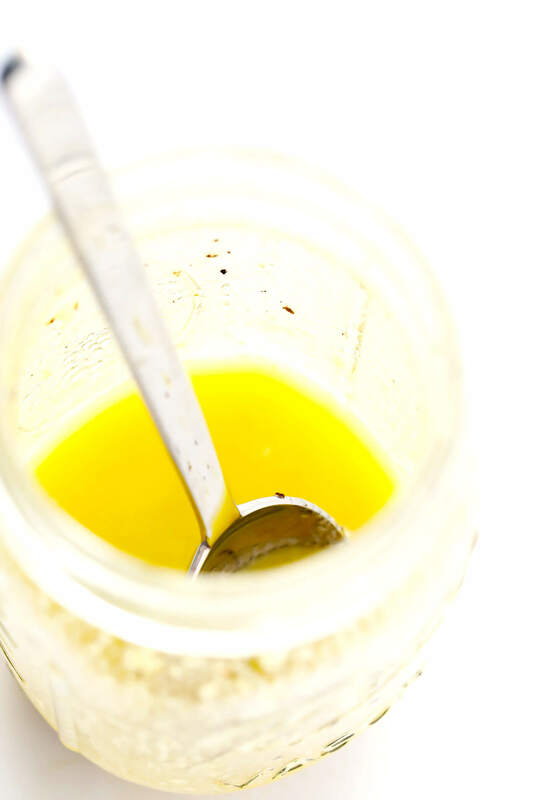 To Make The Dressing: Whisk all ingredients together in a bowl (or shake together in a mason jar) until combined. Use immediately or refrigerate in a sealed container for up to 3 days. 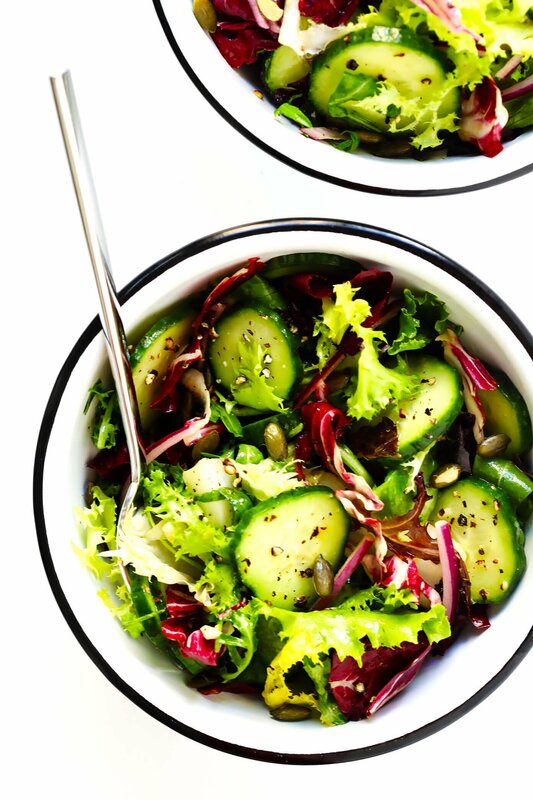 To Make The Salad: Combine all ingredients in a large salad bowl and toss until evenly combined. Serve immediately and enjoy!